Reset CUI verses Restore CUI – What’s the difference? One of the greatest features of AutoCAD is how much you can tailor it to meet your individual needs. 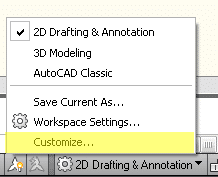 To me, what’s even better than the ability to customize your workspace, is the fact Autodesk makes it incredibly easy to get things back to the way they were if you happen to over customize your AutoCAD environment. The CUI (Customize User Interface) command is both your ticket to customization bliss, and also your interface defibrillator for when things get ugly. For the purpose of this post we’ll assume you’ve over customized your AutoCAD workspace, and want to get things back to the way they used to be. Once again, our tool of choice will be the CUI command. There’s a couple ways you can get to the CUI command. Command Line: Enter CUI at the command line. Both methods will take you to the Customize User Interface dialog. Those familiar with the CUI command know the dialog is split into two parts; left and right. In this post we’re going to focus on the top-left part of the dialog which has the heading Customizations in All Files. The very top entry inside this part of the CUI dialog will list your main customization file. For people running normal AutoCAD, this will be ACAD, AutoCAD Architecture will be ACA, etc. Right-clicking on this entry will display a submenu that has the option to either “Restore ACAD.CUIX” or “Reset ACAD.CUIX”. If you’re like me reset and restore mean just about the same thing, so what’s the difference in this context? 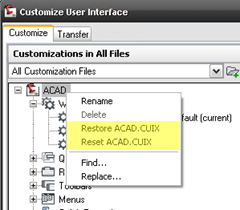 Restore will replace your current CUI (acad.cuix) with an incremental backup of your CUI file (acad.bak.cuix). Both the acad.cuix and acad.bak.cuix are stored in your local Application Data folder (Windows XP: C:\Documents and Settings\username\Application Data\Autodesk\product name\enu\Support). The relationship between these two files is much the same as the relationship between DWG files and BAK files. A BAK file is always one version behind the DWG file itself. Bottom line, restoring your CUI won’t take back to the out-of-the-box AutoCAD interface, but rather a previous version of your own customizations. Depending on the circumstances, my preference is to try the restore method outlined above first, and if that doesn’t fix things proceed to resetting your CUI. The reset option will replace your current CUI file with the out-of-the-box version of the AutoCAD CUI. In case you’re curious, the original version of the CUI is stored in a hidden directory within the AutoCAD installation directory. The actual path is C:\Program Files\Product Name\UserDataCache\Support. Once again, I consider this option the “if all else fails method”, because it will reset the AutoCAD user interface back to the way it was when you first installed AutoCAD. I have AutoCAD 2008 and 2011 on Windows 7, and both are working without any major problems. I had to do some work to get 2008 to work the way i wanted to. This does not work in Mechanical – the option to “Restore” is grayed out an unavailable. What do you do to get back to “out of the box” if you are not using Vanilla AutoCAD? I tried this and it didn’t work. I am actually getting an error that says “The Ribbon does not have any tabs or panels currently loaded” how do I get the original Ribbon back? This was a solution from Autocad with the same results. Were you able to get the original ribbon back ? Im using AutoCAD 2007 and the command was changed when we opened one file which we dont know if it is a virus or what. it’s just suddenly changed the command settings. We cannot use scroller for pan view, it’s not showing the hatch, zoomfactor is very low. so every time we open a file, we always type the command FILLMODE to show the hatch, ZOOMFACTOR, and MBUTTON to use mouse scroller for panview. So how can we reset the command setting? please help us.. I personally have run AutoCAD 2008-2010 on Windows 7 without any issues. Keep in mind many of the Windows profile directories changed between XP and Vista. Thus I could see where you may run into issues importing a 2009 profile from XP to Vista. Again, I know the default out-of-the-box install works for 2009; you may need to invest some time looking into your 2009 deployment, or even what type of Windows login scripts you have running. I got a question… so I did all that, but my actual shortcut commands still dont work. I mean, commands like “L” for line and “c” for circle, etc. How do you restore those? I think I screwed something up when trying to import settings from another computer and now I’m trying to reset all this without having to reinstall AutoCAD2008 all over again. E – Shortcut commands such as L, C, etc are controlled by the acad.pgp file. This post talks about the Command Alias editor (GUI for the acad.pgp), and might be helpful for you http://thecadgeek.com/blog/2009/05/05/becoming-a-keyboard-warrior-the-command-alias-editor/. You can also copy an acad.pgp file from one computer to another.